At Bob Rohrman Subaru, we know our way around tires, especially when it comes to pairing your Subaru with the correct ones it was engineered to ride on. At our Tire Center, we offer all the major brands, and we can also assist you with all-season, summer/performance, and winter tire options. And when it’s time for replacement, our expert Factory Trained Teams will properly mount and balance them to renew your vehicle’s grip and ride quality. We have you covered too! *Ask us about coverage terms and conditions. Begin viewing tire options for your Subaru by clicking the button below. The area where your tires actually contact the road is very small, sometimes no bigger than the size of your hand. This makes it all the more important that they have adequate tread life and are in good condition to help ensure the safety and performance of your Subaru. Choosing the right tires for where you drive. Different climates have certain weather patterns associated with them. This means you may encounter different driving conditions throughout the year than someone with the same vehicle in a different area. Selecting the right kind of tires for the conditions you often travel in are crucial for your safety and how your Subaru handles the road. So, how should you decide? Begin by determining your average driving conditions for the year. Is the climate warm all year long, or do you experience a combination of weather patterns with the possibility of light-to-heavy snowfall? After you analyze which climate conditions you commonly encounter, remember that seasonal extremes can occur, or you may travel to an area that has different conditions than what you’re used to. To help you make a more informed decision, here are some common classifications of tires – each with abilities suited for different climates and driving conditions. As always, we are happy to discuss tire options with you at our tire center, so you can make the best choice for your Subaru. All-season tires are the most common type of tire purchased because they are designed to provide adequate traction for a variety of driving conditions – hot and dry, rainy, cold or snowy – and are ideal for moderate climates. The tread design and rubber compound work well in different driving conditions due to weather, and have longer tread life than summer-specific tires, for example. However, since they’re engineered for a combination of conditions, they are not tailored to provide the level of traction and abilities that summer/performance tires offer in warm and wet conditions, nor the grip and braking performance that winter tires have in cold, snowy or icy conditions. The good news is that tire manufacturers offer a spectrum of all-season tires – some handle certain elements better than others – so if you live in a moderate climate, we will help determine which ones are best suited for the conditions you usually drive in. If you live where it is regularly warm all year long, summer/performance tires are ideal for your vehicle. The tread design and rubber compound of these tires are engineered to “stick” to dry roads better than other tire types, as more surface area per tire makes contact with the road. Most summer/performance tires also offer increased traction on wet roads. Some versions are designed specifically for high-performance vehicles and are even better equipped for speed, cornering and hard braking. Depending on your model Subaru and regional climate, you may want to purchase summer/performance tires for the warmer climates and seasons, but switch over to winter tires when temperatures drop and snowfall is probable. You may want to start by asking someone who has driven with winter tires if they’ve felt more confident behind the wheel during wintery conditions. They will probably say that they have. The difference in confidence is attributed to the type of rubber compound and tread pattern of winter-specific tires. Winter tires are engineered to provide better grip in winter months than all-season tires, and especially more than summer/performance tires. But why? The answer lies in what happens to other types of tires when the temperature falls near or below freezing. All-season tires work well in a combination of dry, wet and light-snow conditions, but, like summer/performance tires, their rubber composition hardens in cold temperatures. This makes them less effective for traction, braking and handling even if there isn’t any snow on the road. Winter tires also have unique tread designs to cope with traveling over ice and snow. What’s the point of winter tires if I have all-wheel drive? It’s common to think the Symmetrical All-Wheel-Drive System of your Subaru is enough to handle what winter brings, but it becomes less effective in slippery and cold conditions without winter tires. Remember, your tires are your vehicle’s only point of contact with the road. Imagine yourself running through a mix of packed snow and ice with running shoes on, versus running through the same conditions with snow boots on. Which pair of footwear is more likely to help you keep your balance or prevent you from slipping? Having the right kind of tires on your Subaru maximizes performance and, most importantly, safety. Should I purchase winter tires? The general guideline: If you live in a region where temperatures reach near or below freezing for extended periods of time, winter tires are ideal because their rubber compound allows them to stay pliable and deliver ample traction. If you have experienced what it’s like to drive with clenched hands on the steering wheel during frequent snowfalls, winter tires may bring calmness to your grip. Is it worth it for two sets of tires? Additional grip and safety are worth it, especially during snowy conditions. The cost of a set of winter tires has the potential of saving you much more, by helping avoid accidents due to slick winter driving conditions. Another way to look at it: Only half the year’s amount of miles you drive will be on each set. By having a designated winter (cold temperature) setup, you will increase the lifetime of your other (warm temperature) setup when it’s used during the warmer months. Couldn’t I use winter tires all year long? We do not recommend using winter tires all year long. As temperatures rise in spring through summer, the soft rubber compound of winter tires tends to wear out faster than all-season tires on warm, dry roads. In the long run, it will save you money to use your winter tires only when the season calls for them. If you decide to purchase a set of four winter tires, our factory trained technicians can properly swap them on and off each season with proper dismounting, mounting and balancing care. We want you to stay safe in the winter months and our team is standing by to assist you with a winter tire setup that’s right for your Subaru. You can browse by brand, size and type of tire by clicking the button below. Simply put, a four-wheel alignment uses sophisticated lasers and sensors to determine the wheel angles of your Subaru. If the computer detects that they are out of alignment – according to specifications – our factory trained technicians make the proper adjustments to bring them back into alignment. Having your wheels aligned – especially after having new tires installed – will help promote tire longevity. Poor road conditions and daily driving can cause misalignment over time. If you’ve felt vibrations or your vehicle pulling to one side, a wheel alignment may correct those concerns. Ever notice this light before? If the TPMS light comes on and stays lit while you’re driving, it is warning you that low tire pressure has been detected in one or more of your tires (excluding the spare). Tire pressure can drop when the weather changes from hot to cold, but it will also decrease if you have an air leak. You can check the pressure yourself. Watch the “Tire Pressure” video above for more information. 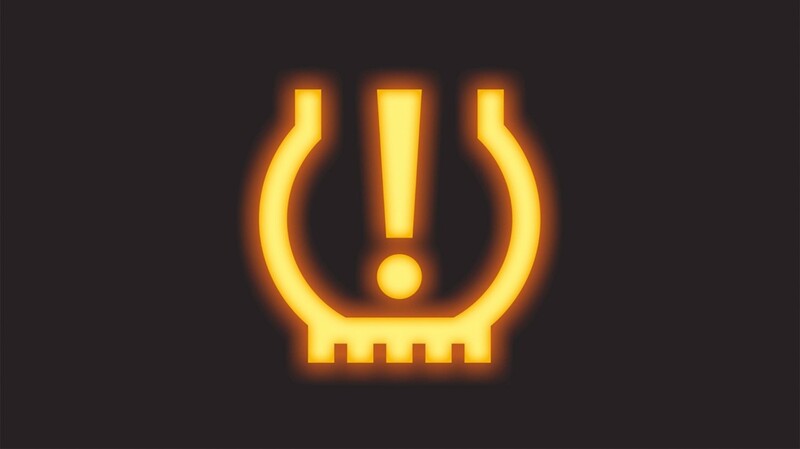 Remember, a flashing tire light may mean there is a malfunction with the TPMS system or a damaged sensor. You can bring your Subaru to our service center if you have a concern, and we can take care of that light for you.